Where ships were unloaded a long time ago, goods weighed and with duties paid lay waiting for the next stage of the journey, today we find small shops, cosy pubs and cafés with inviting summer terraces on the water. 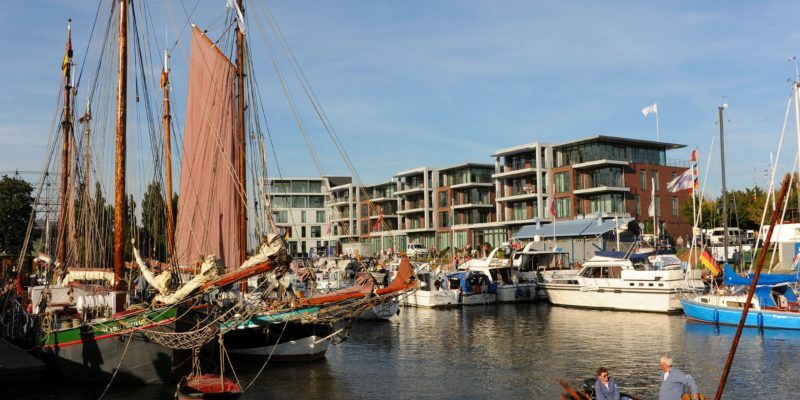 The Hansa harbour in the heart of the picturesque Old Town with the ketch-rigged sailing barge “Willi” or the nearby town harbour with the museum ship “Greundiek” and its berth for leisure crafts show that Stade continues to maintain its traditional ties to water and shipping. 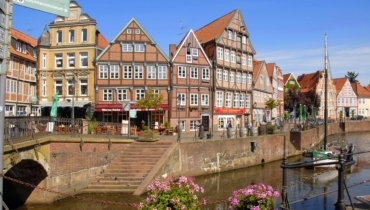 The charming half-timbered town of Stade offers many interesting sights. A journey through its history takes you from Hökerstraße via the town hall to the baroque tower of the Church of St. Cosmae, past the leaning tower of the Church of St. Wilhadi, a brick building built in the style of the Dutch Renaissance and Early Baroque. Nearby lies the Pferdemarkt (Horse Market) with the Zeughaus (Arsenal) dating back to the 17th century. From there it is not far to the Stade Museum Island with its open-air museum. A central point of contact for visitors of Stade is the tourist information centre on the harbour at Hansestraße 16. Besides general information, tickets for a wide range of maritime offers, e.g. 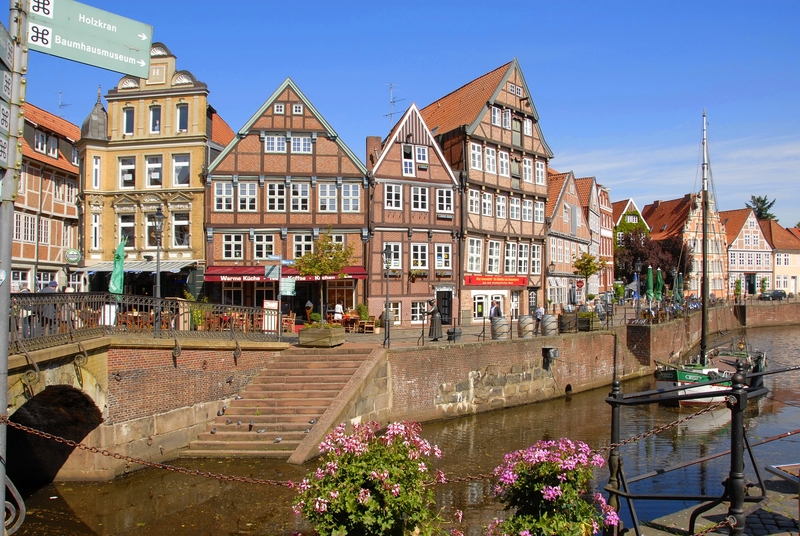 trips aboard a canal boat or the “Tidenkieker” as well as group tours on the river Schwinge and Elbe are available here. There is also an increasing variety of different guided tours on offer ranging from the classic city tour in or without national costume as well as tours of the Alte Land, theme tours, visits of the Camera Obscura to city tours guided by actors representing different historical figures. In the end of 8th century, an urban settlement developed out of a landing-place for small vessels some kilometres inland on the small Elbe tributary Schwinge. In 994, the settlement was first mentioned. Through the end of 12th century, the harbour and the Elbe crossing were important than Hamburg. In 1209, Stade was given town rights, in 1259 a staple privilege for all goods coming from sea. 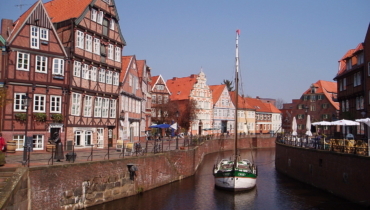 Although Hamburg soon succeeded to break this privilege, Stade still remained an important market place on the Lower Elbe, bound to Lüneburg, Celle and Braunschweig through trade privileges. 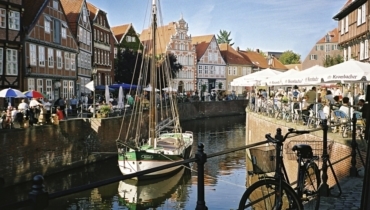 In 13th century, merchants from Stade are traceable in Gent, Utrecht and in Ripen (Ribe) in Jütland (Denmark). Since then, Stade belonged to the Hanseatic League. Yet, Stade abstained from greater undertakings because of its trade in Denmark and the Netherlands and later on because of its decreasing economic power. 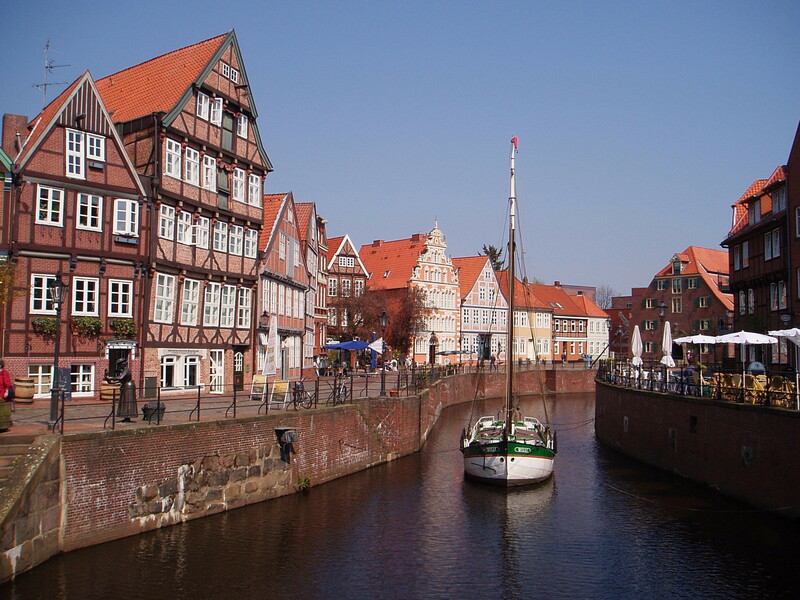 The town tried to secure its economic interests in Holland and Flanders with the help of more powerful Bremen. Temporarily Stade served as an alternate place to pass by the staple in Bruges. Because of its receiving the English cloth merchants, the Merchant Adventurers, in 1587, Stade was excluded from the Hanseatic League in 1601. Under Swedish rule (1645-1712) Stade became administrative centre and was built an important fortress within European context. The burdens to bear because of Sweden’s European wars lessened the economic strength of the town that came under the rule of the electorate of Hanover in 1715 for a long time. It was only in 19th century that the town gradually started growing again and joined the common economic development. The fortification ring around the town was only demolished since 1880. So a first planned extension of the town and new industrial enterprises could be implemented after 1900. 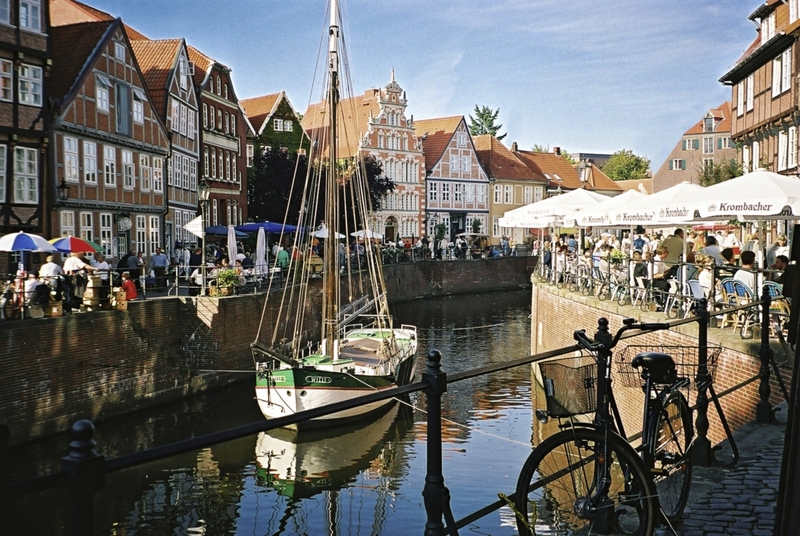 In Hanseatic times, Stade’s population has not surpassed 4.000 and decreased in 17th century. Through the beginning of 19th century, the population remained lower than 4.000 and only increased until 1900 to reach 10.000, in 1939 more than 17.000. In 2012, over 48.000 people live in the town that has been extended through the incorporation of the surrounding villages. The vaults of the trade hall of the oldest town hall that was erected soon before 1279 have survived the great fire of 1659. Together with the old harbour they remind of Stade’s Hanseatic times also still visible in the structure and the running of the streets. The Museum in the restored Swedish warehouse (Schwedenspeicher) at the 13th century Hanseatic harbour gives a vivid picture of the town’s development. The impressive presentation of the Hanseatic times is part of it.